One of the signs at the entrance to the very large youth sports complex in Eagle. Yesterday was my first visit to the park, which felt even larger than it was because I was the only person around. Lots of Canada geese, though. This is one of the signs at the Boise Noon Optimist Youth Sports Complex. Although it is very close to Eagle, it actually is a combined effort of the Optimist Club and the City of Boise. More than 10,000 kids use the park every year in organized football and soccer programs that include Boise, Eagle, Emmett, Horseshoe Bend, Meridian, McCall, Mountain Home and Wood River Valley teams. 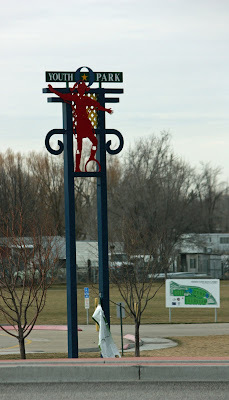 A similar park serves kids and Canyon County in Nampa. Awesome project!! Thanks for the mention.